Owning a home in the picturesque Italian countryside is no longer a dream only for the wealthy. 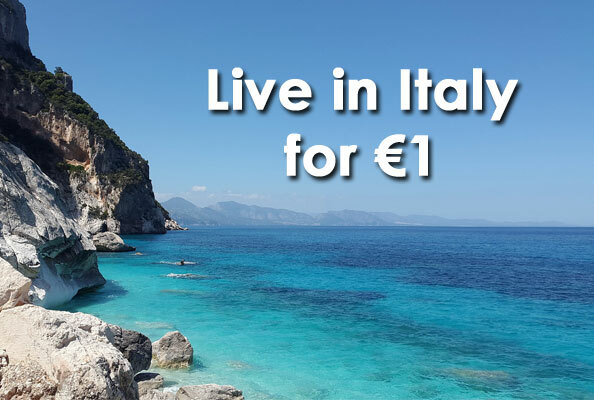 A town in the mountainous Italian district of Barbagia, known as Ollolai, on the Island of Sardinia is currently selling homes for a buck ($1.50 factoring in Canadian exchange rates). Though not the first Italian village to attempt to bolster population with similar deals, Ollolai appears to be the most serious about the initiative and offers natural beauty and a rich history in addition to the loonie price point. Of course there are strings attached to the "two for a twonie" dwellings. The stone-built homes need considerable work to become livable and there is a requirement to complete all necessary home improvements within three years of purchase. The improvements are estimated to be about $25,000 per unit. The payoff for Ollolai will be community revitalization which has lost almost half its population in recent years with few babies being born annually to replace citizens lost to less remote settings. "We boast prehistoric origins," states Ollolai mayor, Efisio Arbau, "My crusade is to rescue our unique traditions from falling into oblivion. Pride in our past is our strength. We've always been tough people and won't allow our town to die." Once Barbagia's bustling capital, Ollolai remains predominantly a natural and undeveloped section of Sardinia where many traditional lifestyles continue to be handed down from one generation to the next. Mayor Arbau compares the struggle to repopulate with discount dwellings to ancient battles in the town's history. These hills are Italy's 'Highlands' and we are sons of 'Bravehearts.'" Arbau initiated the bargain house idea by contacting the artisans and farm workers who had moved away requesting they turn ownership of their buildings over to the municipality. "They're picturesque old buildings made with Sardinia's typical gray granite rock that grows on mountain peaks and shores," boasts Arbau. "We need to bring our grandmas' homes back from the grave." The mayor is pleased three homes have already sold and there are over 100 other offers received including from places as far away as Australia and Russia and hopes the newcomers will enhance job creation and the Ollolai economy. Retired builder, Vito Casula, bought the first of these homes and created a modern residence using eco-friendly building materials and repurposing some of the original décor and furnishings. "The fresh air, zero smog and great views have a healing power. My bones and back don't hurt anymore," beams Casula.